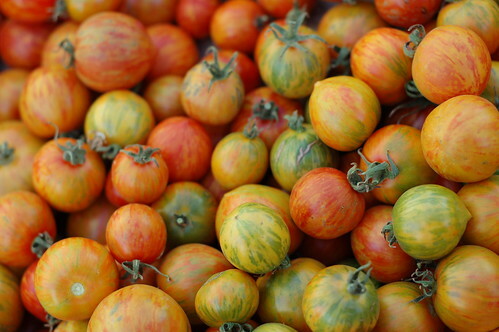 One of the hardest things for me about winter is the lack of good tomatoes. Despite the insanely globalized, fossil-fuel-driven world we live in, it is just not possible to get good-tasting tomatoes in the winter time (nor should it be.) As a result, I've come to view home-canned tomatoes, preserved at the height of their flavor and freshness, as jars of liquid gold. So I reached out to Ben, the head of our CSA, Hearty Roots Community Farm, to ask if we could buy some tomatoes in bulk. He was amenable so, last week, we picked up 20 lbs of lovelies along with our regular CSA share. This turned out to be both cheaper and easier than buying them from a farm stand although that would be a good alternative. Given the limitations on my energy/endurance at this point, we ended up going with these simpler whole, peeled tomatoes both because they're such a wonderful basic ingredient from which to build and also because, perhaps more importantly, they do not require cooking, blending or chopping. Yes, you do have to remove the cores and cut an "X" in the bottom. And you do have to blanch and peel them but that is all relatively easy. Plus, I found the skins floating in the sink surprisingly beautiful. Then you just stuff them into the sterilized jars along with some lemon juice to make them acidic enough not to let any botulin spores flourish in the jars while you're getting around to using them. Then process, remove, let cool and store! 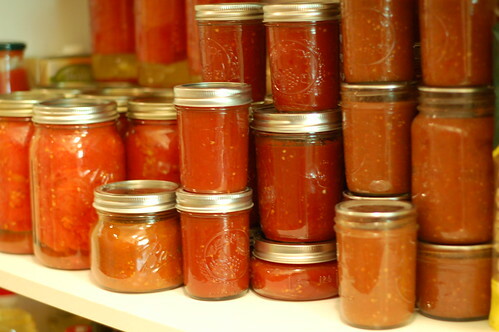 Here's a shot of one of our pantry shelves -- from left to right we have: canned tomatoes, tomato jam, and salsa. And there are several bags of roasted tomatoes chilling in the chest freezer, too. Woot! 1. Prepare a boiling water bath and 4 wide or regular mouth (I like the wide ones) 1 quart jars (or 8 pint jars). Place the lids in a small saucepan, cover with water and simmer over low heat. 3. 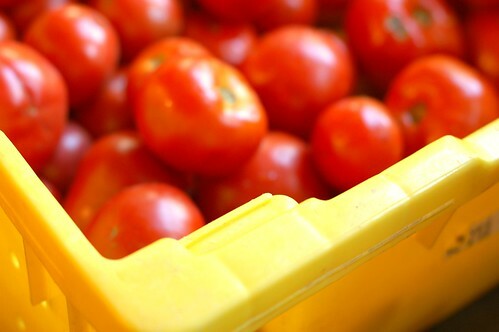 Working in batches, add the tomatoes to the boiling water and cook for 1-2 minutes then transfer to the ice water to cool. 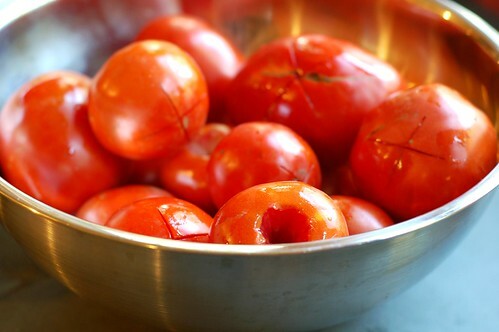 Once they've cooled, remove them from the cold water bath and repeat with the remaining tomatoes, making sure to let the boiling water return to a boil and replenishing the ice water with more ice to keep it really cold in between batches, otherwise, you'll end up having a whole lot more trouble peeling the skins off the tomatoes. 4. 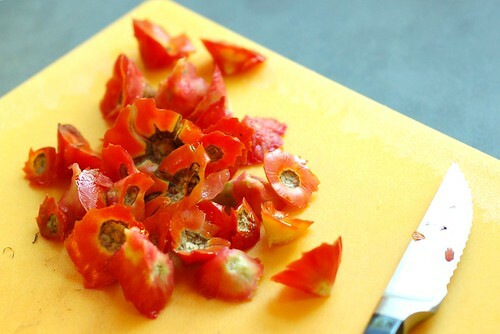 Once the blanched tomatoes are cool enough to touch, peel the skins off them with your fingers - it should slip right off. 6. 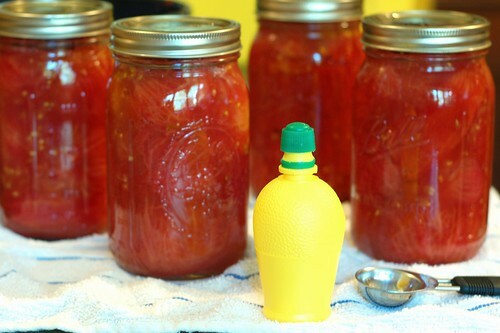 Remove your sterilized jars from the canning pot and line them up on the counter where you plan to pack your jars. Add 2 Tbsps of lemon juice to the bottom of each jar. 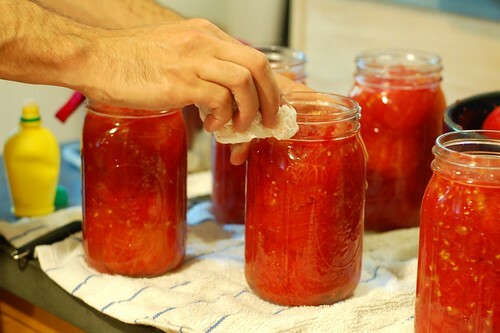 Then pack the tomatoes into the jars - if they don't release enough liquid during this process to cover them, add some of the boiling water to cover them. You want to leave 1/2 inch of headspace in each jar. 7. Gently tap the jars on the counter and then use a knife or bamboo skewer or chopstick to remove any air bubbles you see in the jars. Check your headspace and add more boiling water if needed. 8. Wipe the rims, apply the lids and bands and process in a boiling water canning bath for 45 minutes. Remove the jars from the canner, let cool, then test the seals. Any that are properly sealed should keep in a cool, dark place for up to a year. Any that have not sealed properly should go into the fridge and get used within a week or so. Not feeling totally confident about canning yet? Check out my page of canning directions and resources with links to my favorite recipes, cookbooks and canning and preserving web sites. 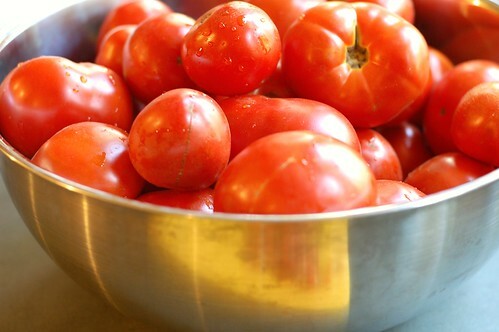 I just canned several quarts of tomatoes. I wish I'd seen your post first. 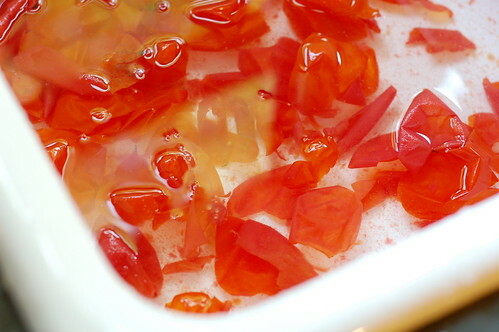 All the raw packed tomato recipes I found were water bath processed for 85 minutes. I will certainly be using your directions from now on! I don't know why people bother with peeling and canning. 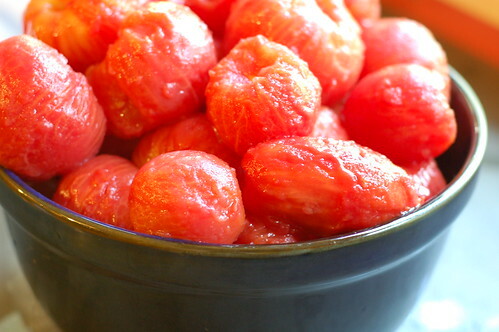 Just plop whole tomatoes in zip-lock bags in the freezer. They're great all winter. Skins never killed anybody. I just made a bunch, but processed for 90 minutes as this is the correct time noted by the National Center For Home Food Preservation in order to make the food safe for consumoption. Interesting! My Ball Book of Home Preserving says to process for 40 minutes for pints and 45 minutes for quarts. So far so good but longer certainly can't hurt.